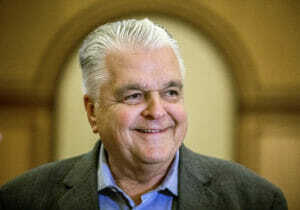 Clark County Commission Chairman Steve Sisolak says he’s not changing his campaign strategy even as his colleague Chris Giunchigliani sounds increasingly likely to jump in with him to a Democratic primary for governor. In one of the first formal addresses since he announced his candidacy in June, the longtime head of the powerful board that oversees the Las Vegas Strip stuck to a narrow topic: conservation and public lands. He touted Clark County’s work to ensure underprivileged kids get opportunities to enjoy the outdoors, and the outreach of a desert tortoise mascot named Mojave Max who teaches children about endangered species. He also nodded to an ongoing debate about the status of Nevada’s two newest national monuments — Gold Butte and Basin and Range. If Interior Secretary Ryan Zinke is listening to public comments as he says he is, Sisolak said, he should retain monument status for all 27 sites in question. “Our national monuments should not be treated like a contestant on a reality show to be voted on or off at someone’s whim,” he said. Meanwhile, Giunchigliani — who didn’t give a speech but mingled with attendees — said after the luncheon that she was still “very, very, very seriously considering” running for governor. 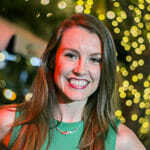 She recently sent handwritten notes to all 63 state lawmakers in one of the clearest signs she’s interested in the seat. An assemblywoman before she was a commissioner, Giunchigliani has endeared herself to progressives by taking positions opposite of Sisolak. She stridently opposed taxpayer funds for a Las Vegas NFL stadium, for example, while Sisolak was a key player in striking that deal. “I believe I bring enthusiasm to the party that you’re not going to find from the other two gentlemen,” she said, referring to Sisolak and Steve Cloobeck. Giunchigliani also took a jab at the likely Republican contender Attorney General Adam Laxalt, who is expected to announce a gubernatorial bid, but has lined up a slate of conservative heavy-hitters including Vice President Mike Pence and Texas Sen. Ted Cruz to attend his annual Basque Fry campaign event. Laxalt held a joint press conference with Clark County’s sheriff and conservative U.S. Attorney General Jeff Sessions last week at an event that attracted protesters. Republican state Sen. Scott Hammond said he’s hired a campaign manager to coordinate his bid for Nevada’s 3rd Congressional District. 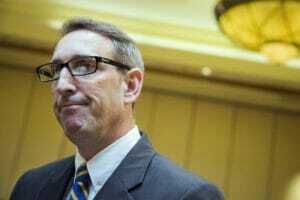 Hammond said at the chamber event that he’d enlisted Ross Hemminger, spokesman for the Assembly Republican Caucus and campaign manager for former Rep. Cresent Hardy’s unsuccessful re-election bid. He said he’s also planning to hold fundraisers and make the rounds in Washington D.C.
Hammond, who’s best known for sponsoring bills to create Nevada’s Education Savings Accounts program, said he wasn’t too concerned about the prospect that Danny Tarkanian might run and try to win a seat that he narrowly lost in 2016. “I love that people want to get involved and I wouldn’t discourage anybody from running,” Hammond said in an interview after the Latin Chamber of Commerce luncheon. 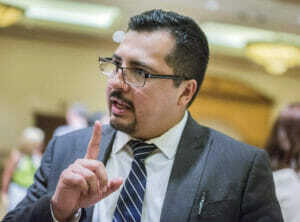 Democratic Assemblyman Edgar Flores said he plans to seek re-election to the Assembly. Flores, who chairs the powerful Assembly Government Affairs Committee, had been noncommittal during the legislative session about his future plans. His name has been thrown around as a potential secretary of state contender. Flores said after the luncheon that he wants to finish work he started in the Legislature four years ago and will re-evaluate his future plans in another two years. Luz Gray contributed to this report. Disclosure: Stephen Cloobeck, Steve Sisolak and Chris Giunchigliani have donated to The Nevada Independent. You can see a full list of donors here.